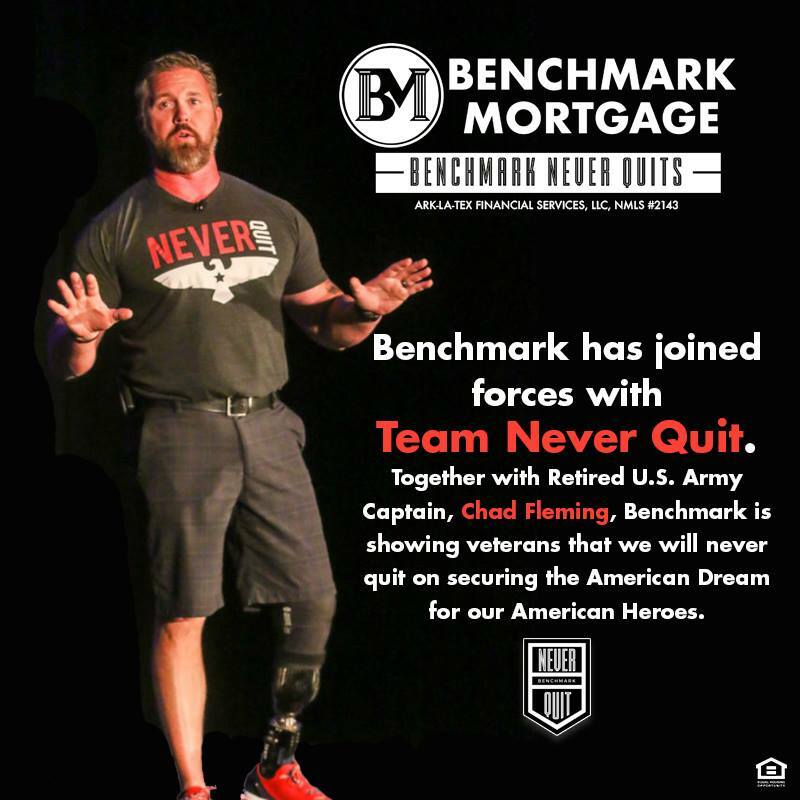 Benchmark Mortgage is proud to announce our partnership with Team Never Quit. This year, we will be hitting the road with the 2018 Patriot Tour! Our Team is proud to have changed the way VA lending is done, and we take a “never quit” attitude with our veterans and their dreams. NO MORE will the veteran be taken advantage of. We have a heart and passion for our veteran community, and we pride ourselves in making the home financing experience amazing. Setting the industry standard for 20 years, we are proud to have helped make the American Dream of home ownership become a reality for more than 100,000 Americans. Home ownership has always been the American dream and we believe that no one is more deserving than those who have served our country. The Patriot Tour features retired Navy SEAL Marcus Luttrell, author of the New York Times bestseller “Lone Survivor” ,a riveting tale of the heroic sacrifices made by Marcus and fellow SEAL Team members assigned to Operation Red Wings in Afghanistan; Taya Kyle, author of ‘American Wife’, Executive Director of the Chris Kyle Frog Foundation, and wife of the late U.S. Navy SEAL Sniper Chris Kyle; retired U.S. Army Capt. Chad Fleming; and retired Navy SEAL and ultra-marathon runner David Goggins. The Patriot Tour brings together things worth protecting, and things worth celebrating: Family, Service, Sacrifice, and Community. We are excited to be joining the Patriot Tour with these amazing heroes. Stay tuned for more exciting updates as we tour the country, coming to a city near you!